It's never been cheaper or easier to make movies, but the initial expense of purchasing a good camera and audio equipment still discourages many budding amateur filmmakers. Fortunately, if you know where to look, you can find plenty of free content that's available for public use. And you can turn that raw material into creative and inventive works of cinema by combining a few free video-editing tools, some hard work, and a place to share your movie with friends and family. Before considering where to find grist for your movie-making mill, let's review the types of gear you'll need to start making your own movies. Though you may own a PC or smartphone with basic audio and video recording capabilities, but all you need before plunging in is a computer that has Internet access. You can find and download lots of free multimedia content from the Web, including audio clips for your soundtrack and full-length videos that you can cut and edit as you please. The lion's share of such content comes from two sources: the public domain and the Creative Commons. The Creative Commons website has an excellent search tool that lets you find works with Creative Commons licenses across various websites, including YouTube and the Wikimedia Commons. Creative Commons licenses enable content creators to release their works for public use without giving up the other protections provided by copyright (for example, work with certain Creative Commons licenses can't be republished for profit). At this writing, more than 400 million works have been licensed under Creative Commons, so you have plenty of material to sort through. If you want to conduct a more specific search for particular content, check out dedicated free-media websites such as the Free Music Archive, which hosts a ton of music licensed under Creative Commons. If you need shorter audio clips (explosions, screams or other sound effects) check out Freesound, an online database of sound effects created by users and freely available for use under the Creative Commons license. If you're a history buff, you might consider grabbing some classic images and video clips for your project. Numerous popular websites (including Wikipedia and Wired) license their images for use under Creative Commons, and you're probably already familiar with one of the best sources for free high-quality images: Flickr. 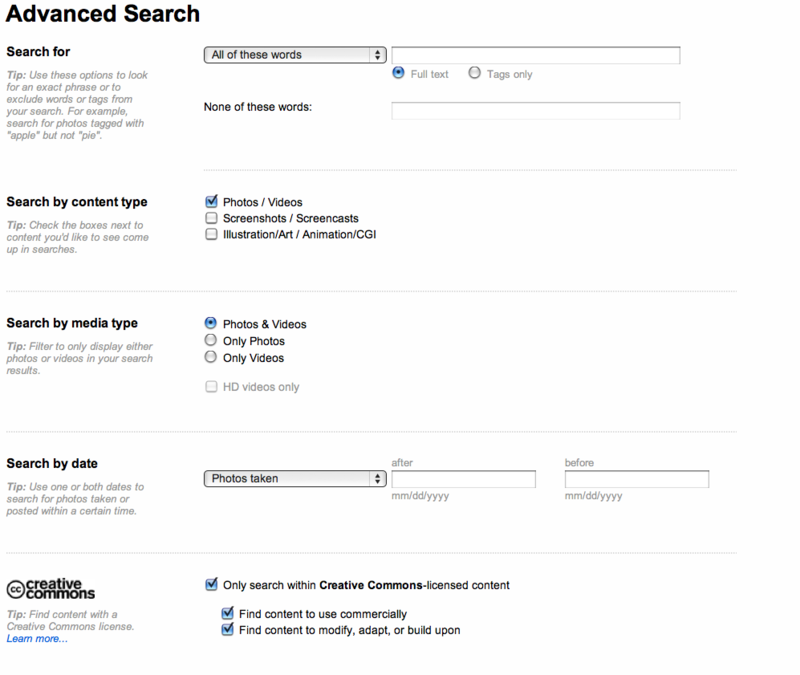 Use Flickr's Advanced Search features to find pictures and video that have been uploaded with a Creative Commons license. To find the pictures you need, start a new search on Flickr and select Advanced Search next to the search bar. Scroll down Flickr's Advanced Search page to find the Creative Commons search option, which allows you to filter your Flickr search to find images that you can legally use in your movies. Check the Only search within Creative Commons-licensed content box, and make sure that your movie uses only images whose license permits you to modify, adapt, or build on them for commercial and noncommercial purposes. Flickr's archive hosts some great video clips uploaded by users under a Creative Commons license, but there are better sources of free video assets. YouTube is an excellent place to find Creative Commons video; just open the filter dropdown menu on any YouTube search result page, and select Creative Commons on the lower right to get a list of video clips that are free for public use. Plenty of successful amateur filmmakers have made movies composed entirely of clips from YouTube--and you can too. If you can't find what you need in the Creative Commons, it may be time to start rooting through stuff in the public domain, which includes commercial works that have fallen out of copyright and are now free for public use. It takes quite a while for a commercial copyright to expire (in the United States, many such copyrights expire 70 years after the author's death), so if you're looking for some post-modern indie rock for your soundtrack, the public domain won't be of much use. On the other hand, tons of great movies from the silent era are available for your personal projects, as are a lot of classical recordings. The Internet Archive has an exceptional collection of old photos, video clips, and audio clips available for use in the public domain, but not everything stored in the Archive is free to use. And unfortunately, there's no one-step way to filter your Internet Archive search results to display only works of all different ages that are available in the public domain. You can, however, use this trick to ensure that all of the results you get are in the public domain: Open the Internet Archive Advanced Search and filter your search results to show only media published before January 1, 1923; any works published before that date have fallen into the public domain and are free to use. Once you have enough material to work with, you'll need some robust video-editing software to make your movie. The technical process of editing video is intricate enough to demand a separate article; in this guide I'll simply point you to some great free software that can help you get the job done. If you need a little additional assistance getting started, consult these timeless video-editing tips. Almost every Windows user has access to Microsoft's free Windows Movie Maker video-editing software, since it comes preinstalled on most Windows PCs. Though Windows Movie Maker doesn't offer many flashy features, you should have no trouble importing your video and audio clips and stitching them together, thanks to Movie Maker's storyboard layout. To get started, select the photos and/or videos that you'd like to include in your finished product; Movie Maker will automatically arrange them into a storyboard-style layout. 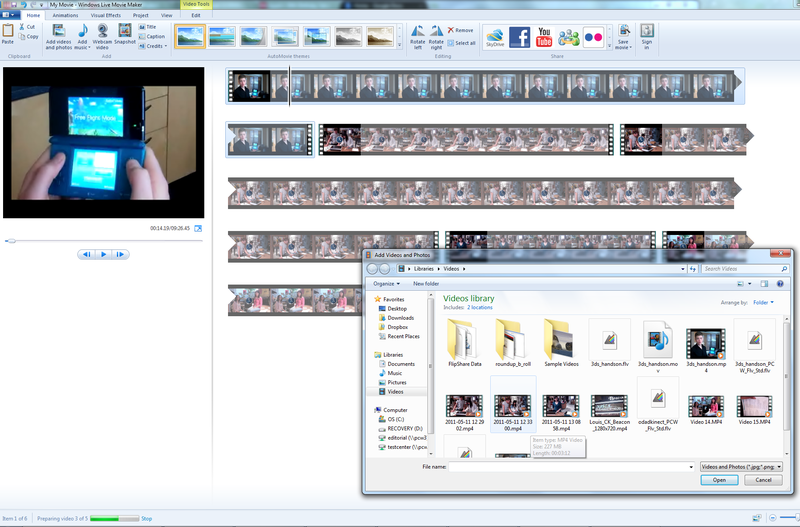 Windows Movie Maker is a respectable video-editing utility that you can download for free. Mac OS users can edit their clips into a single movie even more easily with iMovie, which comes preinstalled on every Apple PC. Simply import the audio, images, and video that you've collected for your project into iMovie, and stitch them together by dragging and dropping clips onto the timeline. You have fewer options for editing clips in iMovie than in a full nonlinear editor like Final Cut Pro, but you can still create great movies by cropping, editing, and adding transitions to your media clips. If you're a Linux user, check out OpenShot, an open-source video editor that's free and (relatively) simple to use. Like most free video editors, OpenShot presents you with a timeline that you can use to arrange pictures, audio, and video clips before knitting them into a single cohesive film. If none of these options works for you (or if you just don't want to bother downloading anything), you can always take advantage of the free YouTube Video Editor, which lets you upload all of your video clips to YouTube and combine them to create your masterpiece. Once you've completed your movie you'll want to share it with friends and family, so head on over to the venerable YouTube or its upstart rival Vimeo. Both websites let users upload videos to their servers for free, though they also offer paid accounts. Vimeo has a reputation for hosting high-quality HD films, but now that YouTube supports watching videos in HD there's no practical difference in potential video quality between the two services. YouTube permits you to upload as many movies as you'd like as often as you'd like, but the movies can't be longer than 15 minutes unless you verify your YouTube account by providing a mobile phone number. Vimeo imposes no time limits on individual uploaded videos, but it does limit you to 500MB of video uploads per week. The first video you upload each week will be viewable in 720p high definition, but anything else you publish that week will appear in standard definition unless you pony up for a Vimeo Plus account. Unless you're planning to become a full-time video producer, a free account with YouTube or Vimeo should satisfy all of your video-publishing needs. Now that you've read up on the fantastic free tools available for creating and sharing your movie ideas, it's time to get started! This story, "How to Make and Publish Movies for Free" was originally published by PCWorld.